Diptych dials were usually made in ivory but brass examples are not unknown. The Nuremberg maker Johann Gebhart manufactured both varieties (see Epact 46465). 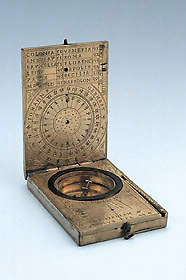 The instrument has a compass, a table of the latitudes of places and two sundials: a universal equinoctial solar and lunar dial and a horizontal pin gnomon dial.